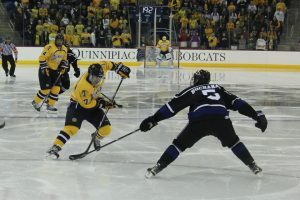 The Quinnipiac men’s ice hockey team (1-0-0, 0-0 ECAC) opened their season Saturday night against Atlantic Hockey foe Bentley Falcons (0-1-1, 0-0 AH), who they held off in a 5-3 win. Though the Bobcats now start the season with a win, head coach Rand Pecknold still thought there was a lot of work to be done. 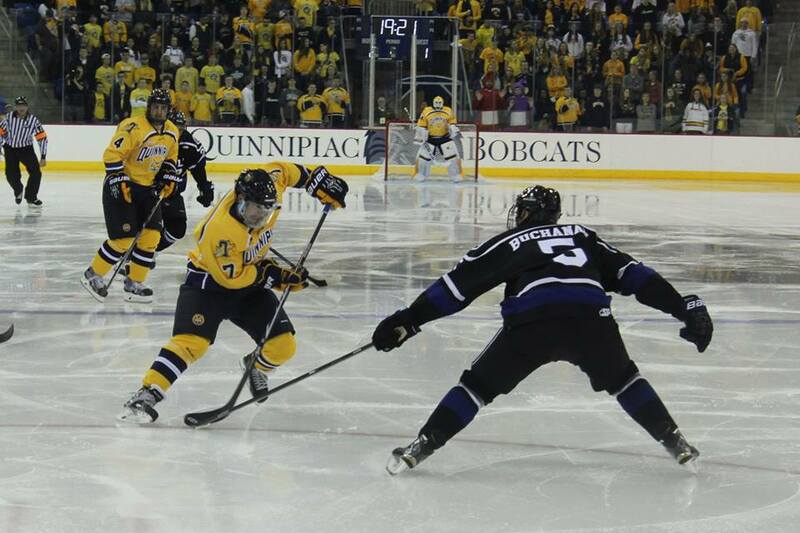 The first goal of the game belonged to freshman Bo Pieper, one of six new players who dressed for the Bobcats. His goal came off of a rebound from a shot by sophomore Tim Clifton. His hard, rising shot got past Falcon Gabe Antoni, giving him his first collegiate point. For Pieper, being able to contribute was what mattered most. Pecknold saw those contributions from the new faces on his roster. In addition to a slew of goals, the game was mired in penalties; with the Falcons having over fifteen minutes served a man down. Quinnipiac took advantage with two third period power play goals, one from senior Matthew Peca and one from sophomore Sam Anas. Quinnipiac was also successful on the other side of the ice on the penalty kill, allowing one goal in eight chances to last year’s number two power play team in the nation. The lone special teams goal put in by Bentley was on a five-on-three late in the third, something Pecknold believed should not have happened. What appeared to be a bright spot was the dynamic of the top line, which features senior co-captain Matthew Peca centering the 2013 Rookie of the Year Sam Anas and true freshman Tanner MacMaster. Pieper believed his line, with his brother Canon at center and junior Soren Jonzzon had some of the same chemistry. The dynamics and developing chemistry will take to the road for a home-and-home series Oct. 17 and 18. They take on 17 nationally ranked UMass Lowell, who upset fourth ranked Boston College on Friday.